Seattle author Katrina Carrasco debuts her new novel, The Best Bad Things, with conversational help from beloved Seatle writer Nicola Griffith. 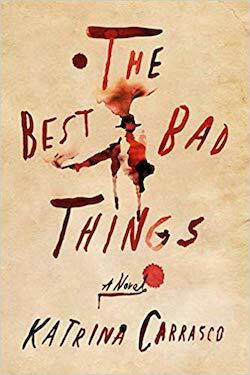 The Best Bad Things is crime fiction about a woman who is a "detective, smuggler, [and] spy" in the year of our lord 1887. Elliott Bay Book Company, 1521 10th Ave, 624-6600, http://elliottbaybook.com, 7 pm, free. Look, first of all, please vote. And then after you vote, you can treat yourself with a reading by one of Seattle's very finest cartoonists, Ellen Forney. Her fabulous book Marbles: Mania, Depression, Michelangelo, and Me was selected as this year’s UW Health Sciences Common Book. Hogness Auditorium, UW Campus, https://www.facebook.com/uwhscommonbook/ 5:30 pm, free. Susan Orlean is one of the best non-fiction authors in the country. Her latest, a history and examination of libraries, is the textbook definition of a balm for troubled times. Seattle Public Library, 1000 4th Ave., 386-4636, http://spl.org, 7 pm, free. Here's a fun one for locals: Seattleness is a collection of charts, graphs, and maps celebrating all things Seattle. Both data visualization nerds and map nerds will find plenty to geek out over in this one, and you're guaranteed to learn something new about Seattle every few pages. Rainier Arts Center, 3515 S Alaska St, 725-7517, http://www.rainierartscenter.org/, 7:30 pm, $5. It's time for the Hugo House's reading series, which offers three writers and a musician an opportunity to create new work on a theme. The readers tonight are Lauren Groff, R. O. Kwon, and Kim Fu (whose The Lost Girls of Camp Forevermore was one of the books I loved most last year.) They'll be joined by Seattle musician Shelby Earl, and the theme is "Diving into the Wreck," which is not the best Hugo House theme, but I'm sure these artists will do something great with it. Hugo House, 1634 11th Avenue, 322-7030, http://hugohouse.org, 7:30 pm, $25. See our Event of the Week column for more details. Seattle poet Madeline DeFrees was interested in place and how it affects interior life. This celebration is a debut party to launch a new collection of essays by DeFrees, many of which are about that very subject. At this reading, the book's editor, Anne McDuffie, will be joined by Laura Jensen, Sharon Bryan, and Jennifer Maier. Open Books, 2414 N. 45th St, 633-0811, http://openpoetrybooks.com, 5 pm, free.